It’s a symbol of excellence, leadership, community and success, and on Monday, Dec. 3, 2018, it became very real for about 900 senior St. Francis Xavier University students who received their coveted X-Rings during a moving ceremony in StFX’s Charles V. Keating Centre on the feast day of St. Francis Xavier. 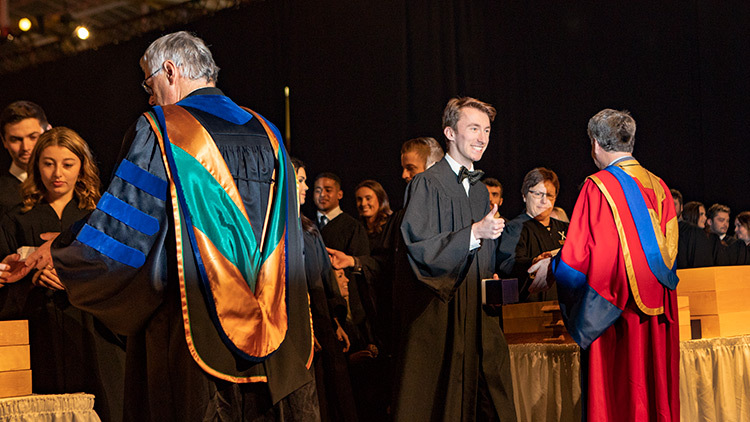 The X-Ring, which represents each student’s unique journey at StFX, must be earned to be worn, and is awarded to senior students annually on December 3 in a ceremony replete with years of tradition and a touch of magic. “It feels like a dream come true. 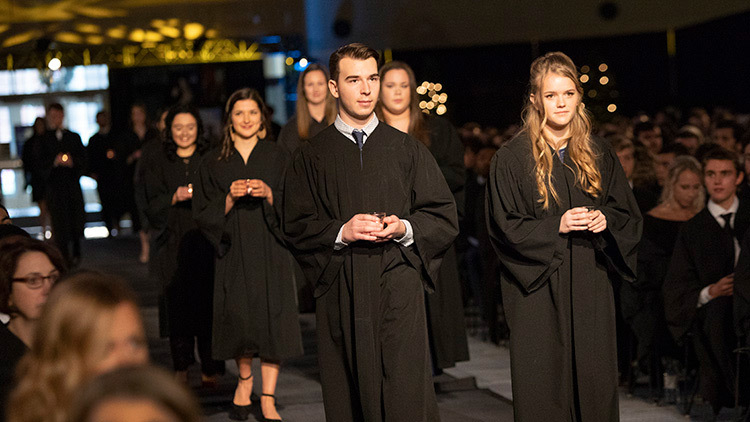 It’s a lot of emotion,” several StFX students said moments before members of the Class of 2019, clad in black gowns, walked one by one to the main stage to receive their X-Ring—a moment they’ve been anticipating for four years, and in some cases, long before they even stepped onto campus. Energy and excitement were palpable across campus. “Finally,” StFX President Dr. Kent MacDonald said in his opening remarks. “I was driving up the street today and saw ‘zero days to X-Ring’,” he said, referencing the countdown signs that can be seen in windows across town. The students today are joining a very special community, and a lot of people have come a long way to join in this celebration, he said as he noted that greetings and well wishes have filled social media from across the country and as from as far afield as Sweden to the Czech Republic. Dr. MacDonald said as he took time to reflect on what this ring represents, he came back to the words of former StFX English professor Dr. Pat Walsh in the Prayers of the Xaverian Family. Dr. MacDonald encouraged the Class of 2019 to remember those words and to make this ring a symbol that brings them always back to the values of looking beyond yourself and believing that each and every one can have an impact in the communities they live in. It was a message echoed by guest speaker Agassou (Augy) Jones, StFX Manager, Student Experience and a StFX alumnus himself. “It is a distinct privilege to possess the X-Ring. It also carries great responsibility,” he said as he shared what the X-Ring symbolizes and talked about how real the StFX family concept is, including the fact he has putting “this beautiful ring” on his finger every day for nearly 30 years. Responsibly comes with wearing this very recognizable ring, he said he encouraged the senior students to commit to utilizing their academics and to socializing and serving in the communities in which they will live. The ceremony was highlighted by student participation. Master of ceremonies was Sarah Comandante, co-president of the senior class, and Salome Barker, with seven X-Rings in her family, offered words of welcome to this long-awaited day. Senior class co-president Carl Miller gave opening remarks, speaking on pride, community and commitment and officially becoming part of the Xaverian Family. Senior student Pheerawich Chitnelawong gave an explanation of the StFX motto, and Claire Keehan read from the writings of Dr. Moses Coady. Dylan Roach introduced the guest speaker and Emma Crilly gave the response. Students’ Union president Rebecca Mesay led the Xaverian Commitment. The honorary X-Ring, presented annually to someone who personifies the Xaverian ideal, was awarded to Dr. Jeff Orr, Dean of the StFX Faculty of Education, who received a standing ovation. Last month in a special private ceremony, an honorary X-Ring was presented to the late Kevin Fraser, who spent 15 years working at StFX with Sodexo as the general manager of food services. His family accepted on his behalf. Poignant moments were many during the ceremony. Candles bearers solemnly marched up to the main stage as live instrumental music filled the room to place the candles in an “X” formation. And at ceremony’s end as the students exited, they tapped their X-Rings on a wooden Chapel kneeler – a long-held X-Ring tradition. December 3rd is also celebrated around the world as alumni annually get together in their home communities to recall when they earned their X-Rings. 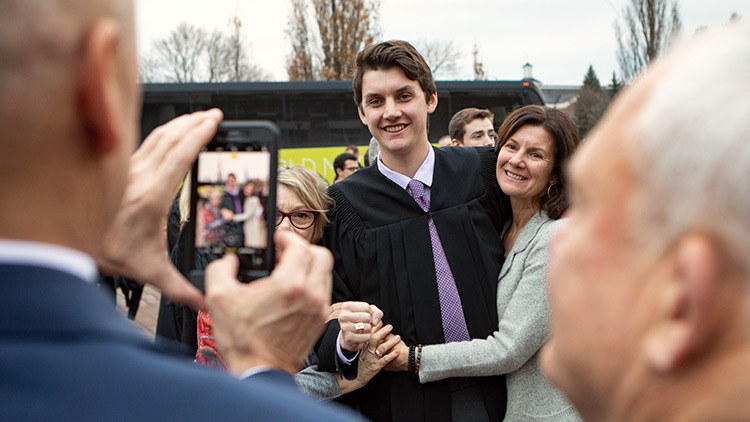 “Breathe it in,” StFX Alumni Association president Glenn Horne said to the Class of 2019 in bringing alumni greetings to the ceremony. “Remember how you feel in this moment. “On behalf of all alumni, we are all proud of you and we look forward to seeing what comes next,” he said as he reminded all that the Alumni Association is always there to support them.